Every year in July the atmosphere of Kyoto becomes mysteriously excited as the whole city prepares to hold Gion Matsuri – the biggest festival of the year that has been held annually for over a millennium. 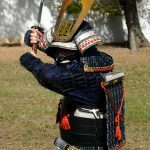 There is a connection between the world of Japanese swords and this historic festival. 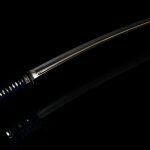 Of the 33 floats, the Naginata Hoko (the most famous of the floats) proudly bears a long blade said to ward off illness and suffering. 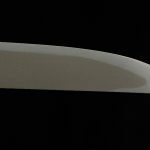 This blade was originally crafted by Sanjyo Munechika, the deified sword smith who crafted Mikazuki Munechika, or Crescent Moon, one of the Tenka-Goken or “Five greatest swords under Heaven”. Sanjyo Munechika is a sword craftsman who lived in the Heian era in Sanjyo area of Kyoto. Only five of his swords exists now. Crescent Moon is one of them. So, what makes people say that this is “the sword among swords”? Crescent Moon is famous for is beautiful curve that continues towards the tip, gradually becoming straight at the end. 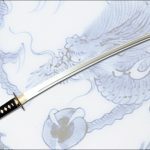 This is a typical feature of Heian era swords; the curve is so that warriors could strike in an instant and also the helps to guard against an opponent’s strike. 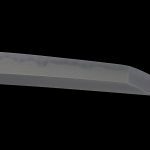 Another exclusive aspect of Crescent Moon is the Hamon. 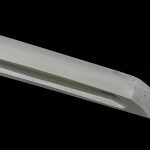 Delicate half-moons appear along the blade’s edge to form an exquisite and unique pattern, this crescent pattern was appreciated as an omen of good luck. This where the name Crescent Moon comes from. 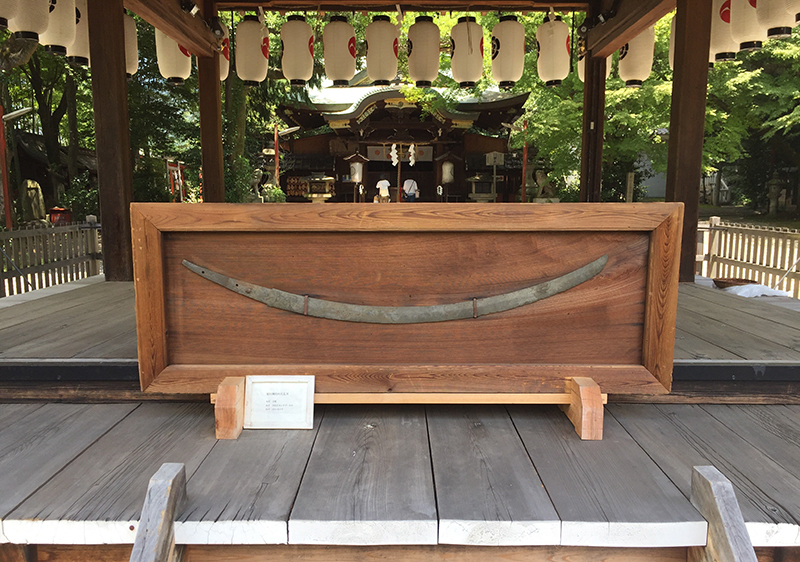 Today the Sanjyo Awataguchi area is like a holy land to fans of Munechika, Crescent Moon and Japanese swords and draws visitors from all over the world. Awata shrine located along Sanjyo street is said to be the “go to shrine” for swordsmiths then and now. 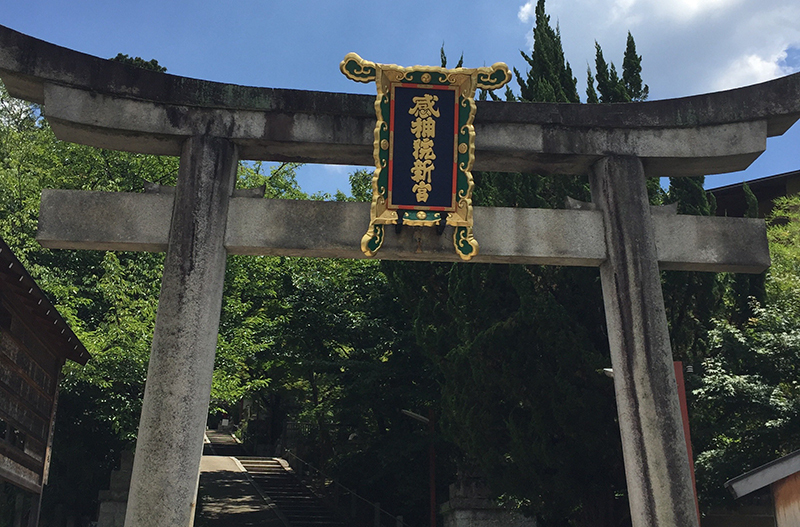 Once you pass under the torii gate, you are welcomed by a huge wood carving of a tachi sword that hints the faithful worshipping from craftsmen. On the right hand side of the main hall, stands a small shrine with small Torii gates, this Kitamuki Inari Shrine is also the origin of the Noh play Kokaji (Small smith). They story goes like this. Munechika was ordered to make a sword, he had no assistant at that moment but this order was in a hurry. He went to Inari Shrine to pray for help. When he started his smith work, an incarnation of the god of Inari appeared and helped him complete the sword. The small foxes on the Aizuchi Inari stamp are the incarnation of Inari shrines. 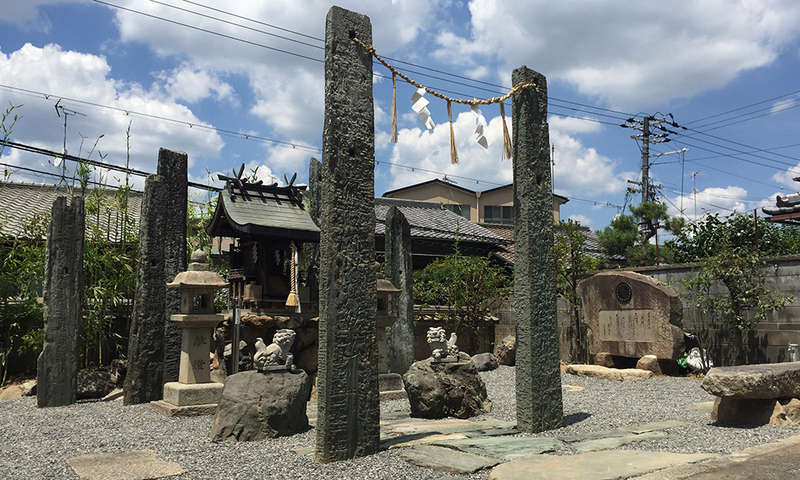 Awata Shirine is also home of a small shrine named Kaji Shrine which stands upon where Munechika used to live. The shrine is small, but impressive and emits an aura of power and serenity. 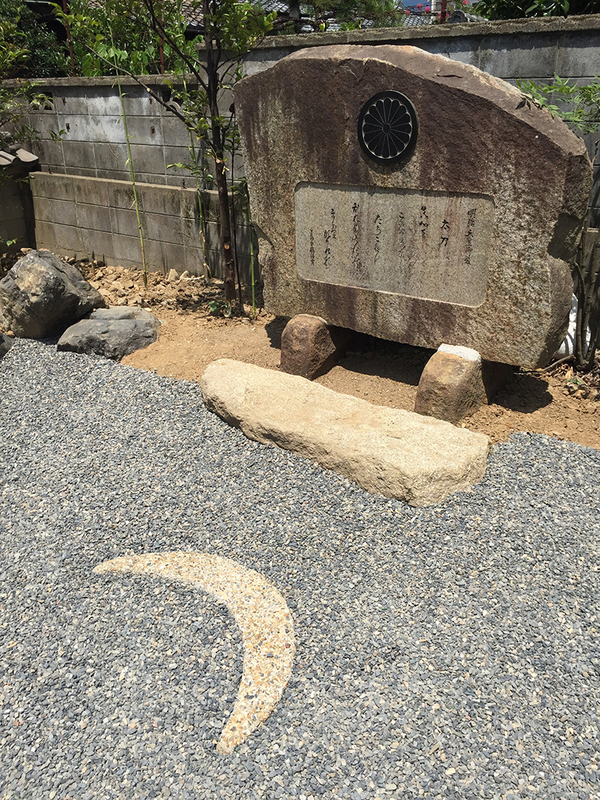 A crescent moon is decorated on the ground to remind one of the great sword that Munechika produced. 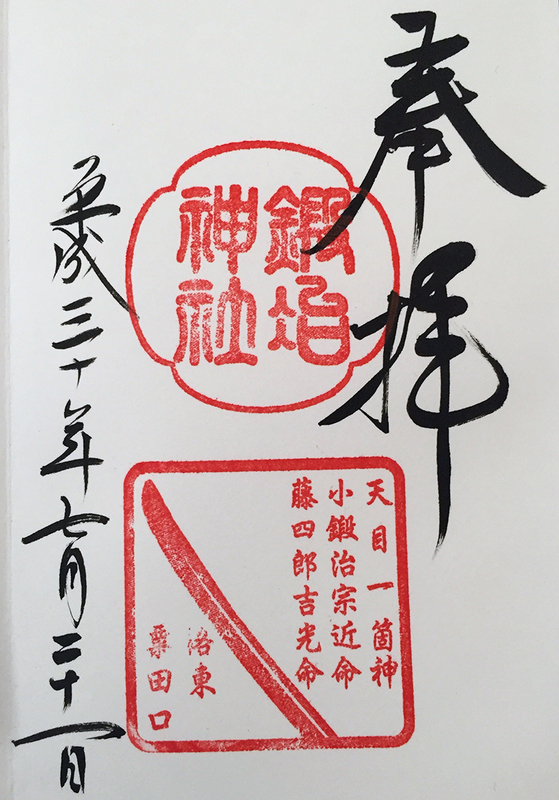 The stamp for Kaji Shrine features a blade and a Tsuka shape emblem. When you stand in front of the altar, you will surely feel the historic energy and almost hear the clanging of a hammer pounding a metal on an anvil.